Push-ups and planks are the two most popular calisthenics exercises being utilized for upper body strengthening, but there are plenty of other methods to use as well. They can be implemented in both core and functional training, which are two different areas of focus. Many argue that it is pointless to specifically focus in either of these training areas, but your body benefits from a variety of different training techniques. However, what techniques provide the best core and functional training benefits? What is the Difference Between Functional and Core Training? These two types of training are effective for rehabilitative purposes and athletics as well. Functional training is when you are performing movements that resemble a daily activity from a sport or life. For example, squats mimic sitting down in a chair and getting up. That is a daily life movement we can often relate too. However, functional training would also be “similar” movements targeting the muscles used for a sport. Squats are functionally effective for wrestlers since they drop low and shoot in. Core training is focused on the muscles that move, stabilize, and support your spine. These muscles are both external and internal, but the ones closest to the spine are the most important. You want these muscles to have a lot of strength because they are the ones keeping the resistance off your spine during compound lifts, and the more internal core muscles are responsible for power output as well. Though these types of training are different; they share the common benefit of strengthening your body and promoting better athletic performance. 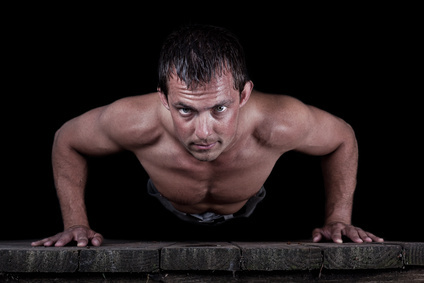 Push-ups and planks are usually both used during each training method, but more emphasis seems to be placed on one instead of the other. Regardless, you will learn that there’s more to training your core for functional purposes beyond the prone position. Planks became popular around a decade ago when a study showed that crunches only use around 65% energy for the contraction while planks use 100%. This was perfect timing for the study since coaches from all areas within the fitness industry were in need of an abdominal exercise with little impact against the lower spine and back muscles. Reverse crunches were first used as a replacement, but eventually research showed they have a negative effect on the spinal curvature. The plank is great for developing six pack abs and targeting core muscles. However, they are an isometric exercise and provide little use for real world application. Isometric means there is no movement and your body remains set in one position, which is not something you do while in sports or even just your daily life for that matter. The issue with this exercise is that it must be held completely perfect for longer durations as you progress, and if you become unstable or need to adjust then the benefits crumble. It is boring and one of the exercises that makes people not really want to train. Doing it in different positions makes it no more entertaining. What client wants to be stuck doing perfect planks before being able to do compound movements? Yes, it strengthens core muscles greatly, but the stiffness of this exercise doesn’t teach your body how to move. Push-ups have a lot more variations to choose from, train core muscles similarly, and increase upper body strength and size simultaneously. Think about it, you are performing a plank just with added benefits. You knock out two things with one movement opposed to perform plank, perform a side plank, and then switch to the other side. By the time an advanced lifter has carried on with their training, they had just spent 9, 12, or 15 minutes of energy on one area of focus. This doesn’t sound very beneficial from a trainer’s point of view. A lot of coaches agree that planks are effective but improperly used, and push-ups are more effective for carrying over to daily activities and sports performance. Let’s consider that you have mastered performing a plank for 3-5 minutes long. Bravo. So now what? Extend it even longer, switch to your side, or do some other movement that still keeps your body stiff? Planking strengthens your core but fails at the basic concept of moving your spine across all three planes of motion. All daily movements incorporate spinal flexion, extension, or rotation at some point. All of the information presented to you was not intended to have you stop doing planks or even push-ups, but rather to open your eyes to other exercises as well. Holding some type of weighted resistance in one hand with no weight in the other hand. Have weight amounts different for each side, which could be with dumbbells, a barbell, or even weight plates. For example, you hold a 30lb. dumbbell in one hand and a 20lb. dumbbell in the other; or you can place 90lbs. on one side of the barbell and 70lbs. on the other. The third variation applies mainly to exercises such as canyon push-ups. You elevate one side of your body higher than the other with something like a box or dumbbell. Let’s talk about the importance of finding your weak point. This is important for all levels of fitness training from the beginner to the advanced. One of the most common reasons a person improperly performs a compound movement is because one side of their body is stronger than the other, which is natural of course. An imbalance in strength distribution could lead to injury. Offset training not only helps identify it, but also can be used to make the weaker side catch up. For example, your right arm is stronger than your left, so when you use dumbbells you notice that your left arm is struggling. In order to counter this, you can use a lesser amount of weight in your right arm while using the adequate amount in your left to make it catch up in strength. Basically maintenance loads for the strong side, and strengthening loads for the weak side. How does offset training carry over functionally? The functional part about this type of training variant is being able to train your mind to have better coordination throughout your body. Pause and think about most athletic activities. You use one side of your body for a lot of situations such as catching a baseball, dribbling a basketball, or even the lead leg for proper wrestling shoots. Try these fundamental exercises out with only one dumbbell being used. Alternate sides after each set; and rest is after both arms or legs have been through the set. Who doesn’t love compound lifts? They work multiple joints for each respective exercise, increase the release of free testosterone, and are great for hitting core muscles both internal and external. People don’t often believe that most compound movements help strengthen the core, but we have to remember that the core muscles are what allow us to exert max power during a big lift in the first place. A moderate-heavy load setting is the best for strengthening your core while also hitting a lot of the muscle groups around your body. Some coaches suggest only heavy loads such as 5×5 programs, which is okay if you are more advanced. Personally, the best exercise to use for making your entire core stronger would be the barbell overhead press. The barbell should be on power rack or squat rack at shoulder height. Place your upper chest region against the bar and press up to clear the rack holders by tiny stepping back about 6 inches. Extend one leg back to hold balance, and inhale with your stomach to utilize your diaphragm. Contract your body while exhaling to press the bar overhead. As mentioned, you are breathing in with your stomach and not your shoulders. When you use your lower stomach to breathe in, it’s using an internal core muscle called the diaphragm. When your breathe in by your shoulders going back it isn’t allowing your diaphragm to contract well enough for all core muscles to react properly. Practice to always breathe in with your stomach and not your shoulders not matter what you are doing.